Thomas G. Schubert, PE is an electrical engineer with JDB Engineering and a lighting design specialist with JDB Illumination. 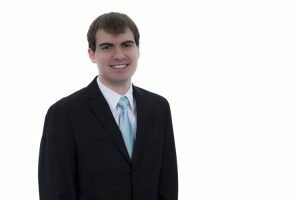 A licensed engineer, Thomas holds a Master of Science in Electrical Engineering and a Bachelor of Science in Engineering Physics from the Colorado School of Mines. He has been with JDB Engineering since 2013 and is also a LEED Green Associate. When he’s not designing electrical or lighting systems for institutional, commercial, or industrial clients, Thomas tends to be a bit busy with life. He’s the father of four children – two girls, two boys – all under the age of 10! And when he’s not focused on work or family, Thomas enjoys a number of creative pursuits including writing (he’s a fan of science fiction), reading, programming, board games, and music. He’s also a volunteer for a youth program in his community. Today he lives in Lancaster County, PA with his wife and children, but he’s got quite the geographic resume. Thomas spent many of his formative years in Nenana, Alaska, but also lived in Colorado Springs, CO and Petersburg, AL in his youth. College took him back to Colorado but he returned to Alaska after graduation, this time in Fairbanks. Before relocating to Pennsylvania, he spent three years in Seattle, WA. Although he’s worked on a diverse number of projects – in quite a few geographic regions – he has three project memories that really stand out. The first is a new six-story Ronald McDonald House in Baltimore, MD, which required a high level of complexity working with a fully-integrated design team. The second is a medical marijuana facility – one of the first on the east coast – which had many unique requirements and relied heavily upon the lighting to “produce” the product. Finally, Thomas was involved with a major IT infrastructure upgrade for a defense contractor, a project that included more than 1.7 million square feet of upgrades over a multi-building campus.